Same spirit, new feel We are the same people who started Akaba in 1986 with more passion than means. The very same ones who, with a design-centric approach made it possible for our products to travel from the Basque coast to the far reaches of the globe. In the 1990s, we refined our products, making them more comfortable and inviting. As a result, you find our products used in community and public buildings as well as in the largest corporations in the world. We remain true to the same spirit of great design, but with a contemporary feeling, embodied with personality and an eye towards satisfying specific needs for our customers. This catalogue pays homage to our respect for the past, our interpretation of the present and how we imagine the future to be. We proudly present the our new collection: Same motion, new emotions. Misma esencia, nuevos matices M.O.R.sillón, JAVIER MARISCAL & PEPE CORTES Defined by two very simple forms that play against one another, M.O.R.sillón is a very inviting piece that makes it a perfect soft seating solution for public areas. Designed by Javier Mariscal and Pepe Cortés in 1986, M.O.R.sillón was one of Akaba´s first designs to receive international recognition. We are proud to share this piece with you as AKABA rediscovers its heritage and one of the avant-garde pieces that offer both, universal appeal and that respond nicely to the needs of the market today. Somos los mismos que en 1986 iniciaron el proyecto con más ilusión que medios. Los mismos que con una apuesta decidida por el diseño, lograron que nuestros productos partieran de la costa vasca hasta los lugares más sorprendentes del mundo. En los 90 humanizamos nuestros productos haciéndolos más accesibles. Por eso podemos encontrarlos en numerosas colectividades. Hoy, seguimos manteniendo la misma esencia, pero con un aire renovado, y con diseños y proyectos más personalizados. Este catálogo recoge nuestro respeto al pasado, nuestra interpretación del presente y un acercamiento a cómo imaginamos el futuro. Te presentamos the new collection: Same motion, new emotions. Xoko Iratzoki Lizaso Collaborative working environments have been a topic of conversation for a few years now. Xoko is a unique seating program addressing this environment. The program was inspired by the idea that a corner, from an architectural point of view, can be an interesting and functional form. Xoko builds its program around an upholstered stool, generous in dimensions, which because of its shape, allows the user several sitting positions as well as the ability to join them in different compositions. The line has three versions of bases, stemming from different applications of use. The first being a versatile stool with four metal legs, which facilitate creating different compositions. The second, is a height adjustable central leg stool, which offers adaptability for the individual user. The third, is a lower version with wheels and an integrated pivoting table designed for environments where mobility and reconfiguration is important, like educational or team venues. It is available in a wide range of upholstery options and a range of standard finishes. Xoko es un programa de asientos pensado para entornos colaborativos. Parte de la idea de que una esquina puede ser interesante desde el punto de vista arquitectĂłnico. Nace como un taburete tapizado de dimensiones generosas en el que sus formas permiten varias posiciones de sentada asĂ­ como la posibilidad de juntarlos creando distintas composiciones. Elevating the interaction between user and product, Gune is designed to expand the function of a simple form of a table top by doubling the top to allow for a lean surface when using the table. This feature works nicely in collaborative working environments where a user can store documents, tablets or phones. It also works nicely in hospitality or corporate casual areas where users can place valuables and small to medium sized items while they are socializing. The tables come with the option of a simple column as well as an elongated version with two columns for larger surfaces. To broaden the offering, the table is also available in stool, chair and lounge heights with wood or melamine tops. Gune tiene un diseño personal y funcional. Se propone con diversas posibilidades de configuración siendo la encimera doble una de sus cualidades distintivas. Esta segunda encimera está pensada para ambientes colaborativos y permite almacenar documentos, tablets etc. para así tener una superficie de trabajo despejada. Las mesas Gune existen con opción de columna simple así como una versión alargada de dos columnas. Aia Isaac Piñeiro Inspired by the Japanese sense of simplicity and harmony, Aia is designed to offer a connection between the human habitat and the natural world. Soft, clean, sensuous curves create a form that affords extraordinary refinement. To enhance the already elegant design the chair comes in natural wood or a wide range of fabrics when the use of upholstery is merited. The painted steel frame in conjunction with wood or upholstery offers versatility in its application. Where minimal sensibilities are needed in residential, hospitality and commercial settings, this chair works beautifully. Aia es una silla de inspiración Japonesa que, con su diseño orgánico de curvas suaves y sinuosas, promueve la armonía entre el hábitat humano y el mundo natural. Tanto su asiento como su respaldo en maderas nobles ofrecen la posibilidad de tapizarlos, aportando así una mayor calidez a la pieza. La estructura de acero pintado, le aporta solidez, convirtiéndola en una propuesta polivalente que encaja a la perfección en oficinas, hoteles, restaurantes y hogar. Evoking a sense of appreciation for its extraordinary combination of balance and form, Kabi is a deep collection of seating that uses a minimal number of components to get the maximum number of options. 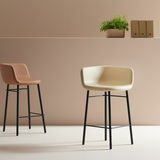 Its polypropylene shell, available in a wide range of colors and upholstery options, is the foundation of the collection and defines its purpose, â&#x20AC;&#x153;More with Lessâ&#x20AC;?. The slightly flexible backrest allows each user to find a position that best suits their body. The collection offers wood, steel tube and wire legs as well as a version with a pneumatic lift and five star base. It works well in all markets and is exceptional suited to casual areas in hospitality settings and corporate campuses. La colección Kabi es capaz de transmitir el máximo de sensaciones con la mínima cantidad de recursos. Su monocarcasa de polipropileno, disponible en un amplio abanico de colores y tapizados, es la clave de esta colección. Está dotada de una sutil flexibilidad en el respaldo que permite a cada usuario encontrar la posición que más se adecúa a su cuerpo. El programa lo integran numerosas piezas, desde estructuras de tubo y varilla, ofreciendo también patas de madera, bases giratorias y taburetes; consiguiendo así una familia completa. Hanna Francesc Rifé Exploiting clean, pure, simple lines, Hanna derives its character, not only from its visual appeal, but by the comfort and the depth of the offering. Francesc Rifé created a system that employs five different leg options in diverse materials such as wood, aluminum and steel, all available in a wide range of finishes and two different back heights. To complement these legs are a wide range of upholstery options that can take the chair from a casual piece to a formal piece. This chair offers a softness in its aesthetics while embracing ergonomic principles that make it perfect for a diverse range of settings, including hospitality, residential, office, institutional and corporate. Hanna es una butaca de lĂ­neas puras, racionales y sencillas. Hemos conseguido darle carĂĄcter a la pieza con un programa completo de hasta cinco patas diferentes en materiales como la madera, aluminio y estructura tubular. La pieza invita al recogimiento y su diseĂąo ergonĂłmico la hace compatible en hogar, contract y oficina. Nora Miguel Ángel Ciganda Integrating classic and contemporary design, Nora is designed to be discreet, elegant and the timeless protagonist, simultaneously. This is born out by the unique combination of birch plywood, painted metal and fabric, which offers tension in the piece without being obtrusive. It also offers a subtle “nod” to craftsmanship in its connections and detailing. It is available in a wide range of upholstery options and a range of standard finishes. The sit of the chair is generous and comfortable. It offers the warmth of wood where the body comes in contact with the chair and the strength and durability of metal where the chair might come in contact with mechanical equipment. It does not go unnoticed that this product embraces form and function. Nora es un ejercicio de diseño clásico y contemporáneo a la vez. Ha sido diseñada para cobrar un protagonismo discreto, elegante y atemporal al mismo tiempo. Una silla con brazos que ofrece una sentada cómoda y generosa, disponible en diferentes tapizados. La combinación de materiales en la estructura, como el contrachapado de abedul y el metal pintado hacen de esta silla una pieza única en el mercado. Usoa Tabuenca & Leache Usoa is more than a meeting table program. Its design integrates efficiency and function with personality. It has a friendly curved shape with no angles and its â&#x20AC;&#x153;compassâ&#x20AC;? leg is ideal for meeting room settings. Its clean, balanced proportions uses the curve as the protagonist in the design, providing a unique functional and elegant table solution. The collection is offered with both wood and melamine tops, with or without electrical configurations, several sizes options and a wide range of colors for legs to add a customized quality to the specified solution. Usoa es más que un programa de mesas de reunión. Su diseño integra eficiencia y funcionalidad, con personalidad. Sus líneas curvas sin ángulos y su pata en forma de compás la convierten en una solución ideal para salas de reuniones. Sus proporciones equilibradas ceden todo el protagonismo a las curvas, dando como resultado una mesa única, funcional y elegante. La colección está disponible en chapeado de madera y melamina, con o sin configuraciones eléctricas, en diferentes tamaños y en una amplia gama de colores para la estructura metálica.